Israeli defense firm Elbit Systems on Thursday unveiled a 1.6-tonne unmanned aircraft vehicle (UAV) designed to fly in airspace currently reserved for piloted civilian planes as a race heats up to deploy military drones outside combat zones. The move came hours after a U.S. rival staged a landmark transatlantic demonstration flight, as arms firms vie to develop drones with flexibility to be used in civilian-controlled airspace – a drive that could spawn future technology for unmanned airliners. Changing security concerns following the dismantling of Islamic State and rising geopolitical tensions have caused European countries to shift defense efforts from far-away conflicts to homeland security, resulting in demand for drones that can be safely integrated into civilian airspace to, for example, monitor border crossings, Elbit officials said. A version of Elbit’s Hermes 900 StarLiner is being assembled for the Swiss armed forces and is scheduled to be delivered in 2019 in a deal worth $200 million. “We are getting a lot of interest from other customers for the same configuration … from all over the world,” Elad Aharonson, general manager of Elbit’s ISTAR division, told Reuters. The StarLiner, being launched ahead of next week’s Farnborough Airshow, is derived from the Hermes 900 operated by Brazil for surveillance in 2014. That operation required closing off airspace to civilian aircraft, something the StarLiner, with technology to detect aircraft and avoid collisions, will not require, Elbit said. The drone is compliant with NATO criteria, qualifying it to be integrated into civilian airspace, Elbit said. It will still need approval of the various civil aviation authorities. The StarLiner has been flying in civilian airspace in Israel over the past year. California-based General Atomics’ MQ-9B SkyGuardian – a version of the widely used Predator family – completed its Atlantic crossing on Wednesday ahead of the world’s largest military airshow at RAF Fairford in western England. Elbit expects to receive approval from the European Aviation Safety Agency (EASA) for its own product in the coming months. EASA was not available for comment. Israel’s drone exports in 2005-2012 totaled $4.6 billion, according to consultancy Frost & Sullivan. They reached $525 million in 2016, accounting for 7 percent of Israel’s defense exports, Defense Ministry data show. 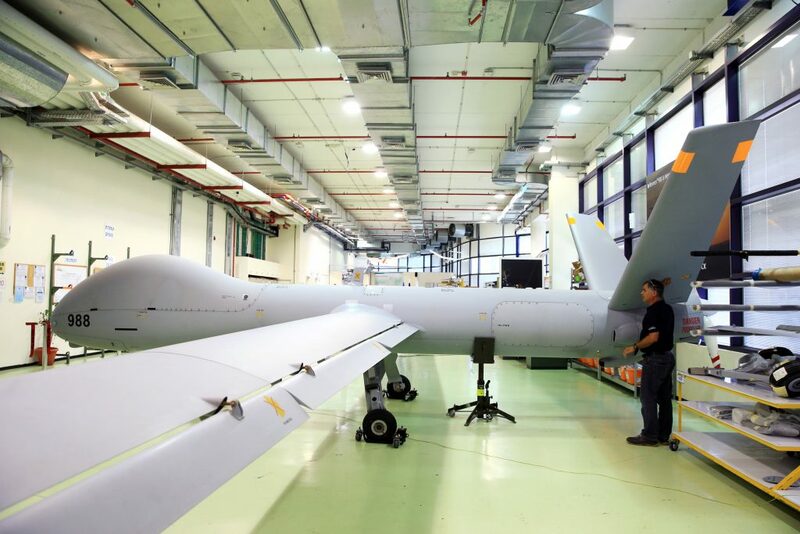 Drones are a major source of revenue for Elbit and state-owned Israel Aerospace Industries. The United States and Israel dominate the industry but face growing competition from cheaper Chinese drones. U.S. military drone makers are vying for a larger share of the global market, which market researcher the Teal Group forecasts will rise from $2.8 billion in 2016 to $9.4 billion in 2025. Flying alongside airliners would expand the horizons of drones originally developed for military surveillance. But it would also call for advanced sensors and software that could eventually filter back into commercial use as developers look at single-pilot and ultimately pilotless cargo or passenger jets. The StarLiner can reach 30,000 feet – the altitude of some commercial jets – and photograph a 31 square mile area, Elbit said. The drone can be equipped with radar, cameras to take video and still pictures, and signals intelligence to analyze electronic signals. “This is a major step towards unmanned civilian planes,” Aharonson said, adding the main barrier to such aircraft would be psychological rather than technical.